The talk around town has centered on a devastating Great Lakes “cyclone” that should be the worst windstorm in recent decades. Even as we speak, it is slowly collecting itself and gaining power. Outside the winds are howling against the facade of my glass porch window. We are on the verge of something major. Could this be a euphemism for the remainder of the Chicago Blackhawks season, too? Do you enjoy corny symbolism like me? That’s about as candid of a response that you will get in the coaching world. Let me just translate that: The Hawks lost twice to teams that aren’t as good as them and should have beaten senselessly. Chicago has played a league high 10 games with very little time for practice in between. Unless you’re Allen Iverson (Practice!?!) then that is a detriment to short-term success. As of right now, the team’s record stands at 5-4-1. If they play the rest of the year at that level, they are almost guaranteed the playoffs. This would not get them one of the top spots, but I also do not expect them to play with such erratic results for the whole year. In fact, I expect far greater things. In the two year wave of success fans are enjoying, there are a few things they should have grown to expect. Most importantly, this team cannot play at a Stanley Cup championship caliber for every game of the season. I think we all remember how they backed into the playoffs last year, albeit with a great record. Even during those stretches, they would lose to the Blue Jackets one game and then take out a playoff contender like the Los Angeles Kings in the next. This is their best asset. No one in the NHL can keep an all-out assault going for their entire campaign. It’s a different, more physical sport than in years past. It’s clearly a subconscious decision not to show up for every game. The same can be said about the decision to elevate their game in relation to how bright the spotlight is thrust upon them. It could be very frustrating, considering that the town was not equipped with a Stanley Cup at the time. Now it’s simply an unsettling fact to remember in the minds of their future playoff opponents. This year has brought nothing but the same in a way. Sure, nine players of varying quality (mostly low) have left town. But that same big-game personality is still intact. Let’s take the results so far. Detroit was their opponent on the chill-inducing banner ceremony at the United Center. The Red Wings have been picked by many, many pundits to take over the Western Conference and the Central Division just like the good ol’ days. The Hawks were not in the mood. They fought valiantly without two of their top players, table-setter Brian Campbell and goal scoring Goliath (this year) Patrick Sharp. Yes, they lost the game. It was a one goal game that left me completely unimpressed with the Red Wings. The Hawks fought valiantly without two of their best players and almost pulled it off. I was very happy with the effort. Clearly they knew it was a big game, too. Let’s take a look at another game. Vancouver is the odds on favorite to win it all by a great number of the writers in the hockey press. When they entered the United Center to face-off against the champs, it was the first time since their ignominious defeat on home ice during the playoffs. They certainly would be a challenge. Enter Marty Turco. The Canucks came out and played a decent game. They actually held the edge in shots at 37-32 which is becoming a disturbing trend. But just like fans were promised, Marty Turco shined and stopped all but one before winning them a shootout in the last frame. Every step taken that removes doubt in the minds of Chicago fans about its goaltending is a good one. It shouldn’t even be an issue. The rest of the team shined as well. It seemed even though the Canucks took more shots, they just weren’t great opportunities. To the observer, the Hawks forays into their opponent’s territory just seemed more dangerous and well-crafted. New blazing speedster, Viktor Stalberg, eventually scored the only Chicago goal, which was beginning to seem inevitable due to his strong play. Despite it being a Canucks-Blackhawks game, there just seemed to be a lack of passion on Vancouver’s part as well. Don’t tell that to Kevin Bieksa, of course, as he was right on cue with his idiotic penalty taking. Luongo was his old self, too, as he had himself an imposing game in goal only to spring a leak when it mattered most. This time in the shootout. There was a lot to take out of this game, though the box score may not reflect it. One important point to be taken into account was Dan Hamhuis’ absence due to injury. My guess is that Brian Campbell being gone would be an equal loss. To some, a shootout win and a close loss would not amount to much. But in the context of this article it holds a lot of water. Vancouver and Detroit were shown to be beatable, and by a team that was just getting its game together after all of its offseason losses. And more importantly, proof that these even younger hawks can turn it on when the time arrives. Add a couple of comeback victories against the Sabres, and you have a team that even in the early going, has shown familiar championship qualities. Lets go back to Marty Turco, who may just be the Hawks new “Ace in the Hole”. He’s an exceptional goalie. Not only is he better than Niemi was (or currently is}, he might be something special. After a slow start which can almost completely be blamed on the play of his other teammates, Turco has exhibited some great skill. He was the goaltender in each game of our recent four game winning streak. His save percentage over those games was .944, which would win him the Vezina Trophy almost any year if he were able to stretch those numbers over a full season. Don’t worry, I’m not saying he will. I would highly doubt that. I’m also not saying that he is the best goaltender in hockey. But, I will take him over Anti Niemi in a heartbeat , as well as most of the other goalies in the league. Here is a sports question that I think we have all heard at least once. Who is more important to their team, the Quarterback or the Goalie? I’m not going to weigh in on that quandary, but I think Hawks fans should rejoice that we are definitely the proud owners of a goalie who can put his team on his back through tough stretches. This shouldn’t even be a team that needs to be lifted very often. But this is the unpredictable National Hockey League and some days are better than others. Slow starts by Toews and Kane are becoming an old story. I’m not a morning person either, and this is certainly the dawning of the new NHL season. These two players should be in control of Chicago’s NHL destiny for years to come. Does anyone think that Toews and Kane are somehow not as good, even as they are only on the cusp of their early 20s? There are no more tests for them. They are not flukes. They are not overrated. They are both superstars and blessed with talent. I don’t think it is even worth wasting time on this matter. These two are on the upsides of their careers. Their play will not be an issue. In fact, when they hit their stride, this team could be a monster. And let’s not forget about Marian Hossa, who could keep control over the puck in a tidal wave—or maybe even a cyclone. At last he is fully rested and fully healthy. He also has finally won himself the Stanley Cup. Lets remember that last year he was a series loss away from Dr. Melfi’s couch. The “curse” is a memory. Now that his enormous personal quest has been fulfilled, he is playing with a ferocity that is causing the rest of the league to take notice. Last year in the playoffs, Chicago didn’t really even rely on his scoring to take home the title, though he was invaluable in plenty of other ways. Imagine if he had been playing at this level back then. This is a new weapon we now have. Patrick Sharp is also having a superstar-like year in the early going. 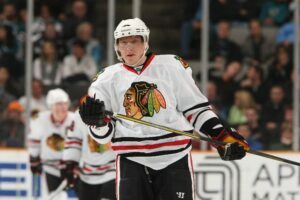 He is tied with Hossa with 11 points to lead the team. Add that to the mix and things are looking pretty positive. In a sport of intangibles, the Hawks are missing the presence of Brian Campbell. Just like last year during their swoon at the end of the season (and first three games of the postseason) Campbell’s absence is glaring. Much more than a defenseman, he was the spark that lit the offense. Getting the puck up and down the ice has been slow going so far. Something is missing in the Blackhawks rapid-fire attack. Once Soupy returns, the “rapid” part should be right where they left it. This will eventually be a team that can start a fastbreak with every single player on the ice, including the goalie position. The defense will also be shored up, and the constant line changes will settle as well. Duncan Keith should be able to get some extra rest. At this pace, he may look like Hans Moleman from the Simpsons before season’s end. Let us not forget the improving play of our new replacement players. Viktor Stalberg has already been mentioned earlier. Potential is great, but surprisingly, he is actually converting on it. Can this guy really be faster than Patrick Kane? The short answer is yes. Now that does not mean that he will ever approach the career that Patrick Kane will eventually have himself, but it does add a strength in an area that preseason analysts had as a weakness. He is basically the new replacement for Kris Versteeg. By season’s end, he may surpass him in achievements. Even if this is not the case, it is a net-gain for the team. Jack Skille has filled in ably. Not a game-breaker, but certainly a player who has been given the full-time NHL experience and is running with it. Fernando Pisani has been serviceable as well. It seems like he just needs a bit more time with the team to get into the flow. After all, his past career is reflective of a player that can be a decent fit if he remains healthy. Hopefully that will be the case. Even the players that were with the Cup-winning team have stepped up in new, more important roles. The high-energy Tomas Kopecky has taken that asset to a new level. Calling him an enforcer might be overkill, but he is something more useful. He is someone who will risk his body and open his mouth to get inside of his opponents’ mind. Maybe he went to Adam Burish’s training camp, because they are becoming similar players. Now for a bit of the negative. John Scott is not making a good argument for himself to continue with the Hawks. It would seem that he is the type of player that harks back to the NHL’s recent past, where teams would grab gigantic and muscular goonish players that had no business (or skill) skating. He plays just about as well as a 6’8″ human being should play, slow and awkwardly. Imagine Manute Bol on ice. OK, OK, I don’t want to belabor the point. He is highly intelligent and has a witty personality. Its just the hockey playing that is lacking. He appears to be the only puzzle piece that will just not fit. So, if this team has so much potential, then why does it seem to be floundering thus far? 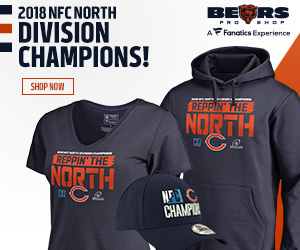 Isn’t this team supposed to be destroying the competition like some sort of strange Chicago-Land windstorm type thing? The first question has been partly answered. Its due to new players, injuries, a horrific early schedule and cup fatigue – Stanley that is, not the other kind. But let’s be honest, most other teams in the league would be just fine with our record. Not a bad place to be situated. The Blackhawks have finally, mercifully gotten some time to lick their chops. Now its time for the coaching staff to work out the kinks. Joel Quenneville is the master of such moves. This three day period before their new home stand will help the players gain control of the mental mistakes that have been taking place while gathering rest to counteract the beating from their early schedule. This should work wonders. A strong out-of-the-gates performance should be expected while they are in town. But I think this should be expected for most of the season. And once Brian Campbell returns, the real results should be viable. This should raise a few spirits. We now have two stars in Hossa and Sharp that have elevated their games to new respective levels. Our goalie is much better than the Huet/Niemi duo from last year. Toews and Kane are due to reach their all-star production right about… now! The young hawks are coming through and still have a great deal of upside. Not to mention that we still appear to have that big-game ferocity. Looks like it could all come up Blackhawks. But we all know that hockey can be a cruel mistress. And just like every one in town, I will believe it when I see it.